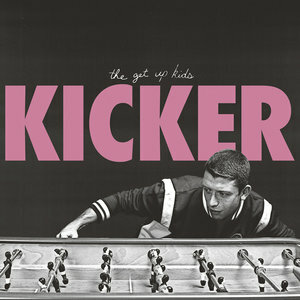 The Get Up Kids are searching for an elusive position, that nostalgic allure of their previous glory on new EP, Kicker. Don't call it a comeback, or do. It kind of is. Whatever. Either way the Get Up Kids, a figurehead of early aughts emo wave have returned with their first release in seven years, the Kicker EP. Our current music culture is one of eternal regenerations, retirements, and comebacks, so the reunion issue is moot, to be sure. But, here we are with a new EP from a group that has left and returned and then left again. Moreover, it's a reach back to the old sound, the old feeling. The Get Up Kids are searching for that elusive position, that nostalgic allure of the previous glory. It's not a failure though, so let's let them kick it. The last we heard from the Get Up Kids was their last comeback. After 2004' beleaguered The Guilt Show, they sat back for seven years. 2011's There Are Rules saw a return to recording, but not a return to form. They had been moving more towards a pastoral pop style ever since 2002's On a Wire. There Are Rules saw the band sounding like a heavily-produced indie rock band with an austere side. It was just fine, but then they left our sight again. As it is, Kicker is a definite throwback. There's no denying this from the start, as "Maybe" begins with a swirl of noise and guitar, seriously reminiscent of the opening track on their most beloved album, 1999's Something to Write Home About. The homage to their younger selves does not end there either. "Better This Way" uses the same chunky riffs and histrionic, half-yelled vocals the band was so famous for nearly 20 years ago. It's not a shame, as what worked in 1999 still works in some circles. On the closing track, "My Own Reflection", Matt Pryor sings in a stiff voice: "It's hard enough to stay awake, let alone to motivate." The inflection betrays a lack of confidence, a weakness of voice. Yet, the band joins him for the next line, "But we do this every day", and the improvement is easily noted. Eventually, the keyboardist, James Dewees, is given time to stretch out, and the song begins to breathe and build. Before we know it, though, this EP is over before it fully blooms. It's not a big statement, and it's a little awkward in spots. It's just a little warm-up, a little kick in the seat of the pants. There's more to come I'm sure.